Barbecues are pretty boring they all look very similar, one barbecue owner decided he wanted to give his grill a new look, and what better way to make it unique than a Mario Mushroom makeover. This fun Mario Mushroom Barbeque grill is the work of Greg Mata, and Greg calls his cool creation the Grilltendo, and Greg has to use special paints to make sure it would stand up to the heat. This is my first summer living with 2 of my best friends and my first summer without a grill. We all wanted a grill but the biggest problem is that my friends are vegans and I am quite the carnivore. So we wend and bought to grills one for me and one for my friend and his wife. Now the only thing is how to tell them apart because they are the exact same grill. Then one day on my way into work I thought why not paint it to look like the Mario Bros mushroom. And that is what you see here. 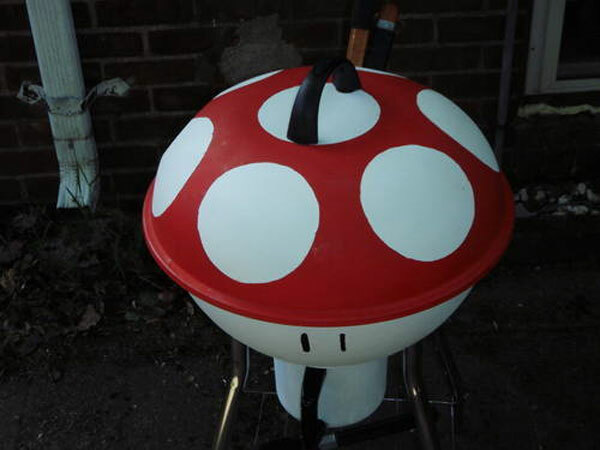 You can find out more about the Grilltendo Mario Mushroom barbecue grill over at Craftster.